Okay, if you’re along the southeastern U.S. coast, you may be battening down the hatches or cleaning up after a visit from a hurricane named Matthew. Anybody in the danger zone should take heed and do what’s necessary to stay safe. A hurricane is nothing to mess with, and your and your family’s safety comes first. But if you’re anywhere else this fine October weekend, why not go cemeterying? Go out to play in a cemetery somewhere this weekend, take pictures of the tombstones, and upload them to the website Find A Grave. Oh, and meet other genealogists doing the same thing, if playing in a cemetery wasn’t enough fun for a genealogist by itself. 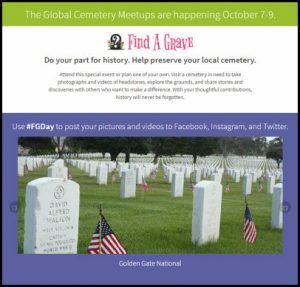 Starting tomorrow, October 7, and running through the whole weekend, folks who are members of Find A Grave (and it’s free to register and join) are getting together for what’s being called the Global Cemetery Meetups. So far, there are 175 meetups already planned: mostly in the United States, but so far 17 in Europe, four in Australia, four in New Zealand, and more to come. There’s a cemetery etiquette guide available online if you’re planning on joining in — something to review to make sure we all understand the do’s and don’ts of taking pictures in a cemetery. The whole aim here is to help out other genealogists — those whose ancestors are buried far from where we live today, keeping us from being able to visit the cemeteries and take our own photos of their tombstones. If we all pitch in and photograph tombstones near where we live, we help each other: you photograph the stones for my ancestors near where you live, and I’ll photograph the stones for yours near where I live. Find A Grave isn’t the only game in town, of course. BillionGraves also makes tombstone photos available, and both services are free for anyone to use. And if you already have plans this weekend, well, there will be other weekends — and there are so many requests that are outstanding for cemeteries everywhere. One thing I will ask: if you join in, and you upload your photos to any site like this, make it clear whether you allow others to use your photos without asking for your specific permission or whether you want folks to ask for permission before they use them. We all want to respect others’ copyrights in their photos, and if you don’t want to make people go through the steps to ask specifically each time, it helps to say so right at the start. Happy cemeterying! And thanks — it helps me when you photograph my ancestors’ graves, and I’ll try to return the favor when I can. Ha! I was just looking at this page and getting ready to check the weather. You’re a mind reader, Ms. The Legal Genealogist. A number of cemeteries I wish to photograph are on private property behind locked gates and NO trespassing signs. Good luck getting access to those in Mississippi and Alabama. Working with local societies (genealogical and historical) to get access at specific times is the way to go with those private cemeteries. Telling the owners that they’d stop getting so many people wanting access if the stones were all photographed and online should help!! But getting the locals involved is essential. In Mississippi it is an out of state deer hunting club that locked us out and it is legal until the state law changes. You could be arrested for trespass or shot by hunters. This is rural Mississippi. That county also had no local genealogy or historical society. In Alabama you have to get permission from the landowner in advance or you can be arrested. If asked they have to let you on the property, but it often takes multiple 3 hour trips to get access. It can be done but it is expensive and time consuming. Local societies in these rural counties vary a great deal in their effectiveness. Some cemeteries are well cared for and some are overgrown with giant briars and rattle snakes. (Smilax is an evil vine in cemeteries of the South). We are grateful for the cemeteries that we can care for.